ACP Board has thoroughly discussed the forthcoming FIDE Presidential elections and unanimously voted to support the candidacy of Arkady Dvorkovich. It is the first time ever ACP takes a stand and supports any candidate in any elections. This does not come lightheartedly: to the contrary, it is a consequence of the ever deteriorating situation in the chess world caused by the malfunctioning of the present FIDE leadership. We have repeatedly expressed our disagreement with many decisions taken by FIDE and we firmly believe it is time for drastic change. We do not believe that the people who managed FIDE for over thirty years will be able to change their approach and policies if they are re-elected. In fact, judging by their attitude and official platform, they don’t even plan to change. We need a new team with a different vision. The program of Mr.Dvorkovich includes many important points that ACP advocated throughout the years and we believe it can bring a major change. He possesses skills and experience and he played a key role in organizing a whole range of top chess events. We believe he is able to lead FIDE and the chess world to the heights our game deserves. We also share many points aired by another candidate, GM Nigel Short, and we think he could be an important member of the new team. However, his very limited managing experience and different set of skills lead us to believe he would be better suited as a valuable contributor rather than a leader. 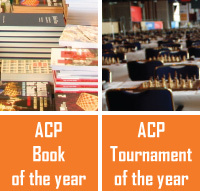 ACP Board finds the forthcoming 2018 elections to be critical for the fate of the entire chess world and we call upon the federations to make a wise choice.